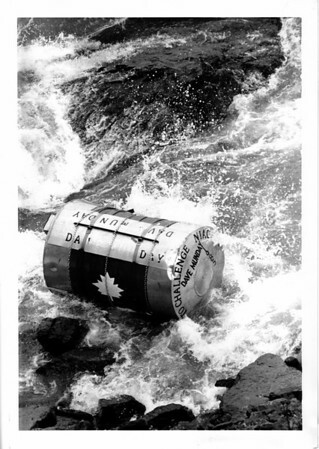 The empty 750-pound barrel in which John David Munday had ridden over Niagar aFalls lies in shallow waternear the falls Oct. 5 1985. Munday got safely out of the barrel some time before it was retrieved. He'd already attempted the stunt the previous July, but had been stopped before he could complete his ride over the falls. Rob McElroy photo for AP.